DescriptionBurned fragment of a prayer book. Text appears on both sides of paper, which is discoloured from fire exposure. Edges are noticeably charred. ProvenanceGifted to the Vancouver Holocaust Education Centre in 2009 by Andrew Rosengarten. The donor's mother, Eveline Rosengarten (née Berger), was the original owner. She found the burned prayer book fragment in front of Fasanenstrasse Synagogue in Berlin, Germany on November 10, 1938, following the destruction of the building during the Kristallnacht pogrom. 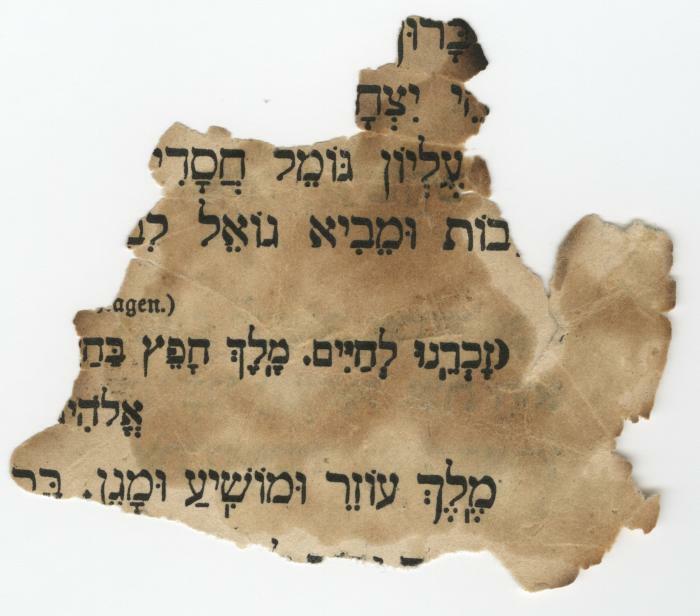 Fragment believed to be from the Siddur Sephat Emet (Rodelheim), page 90. NoteFragment has been removed from frame.